The book is available directly from the publisher or soon from European retailers. 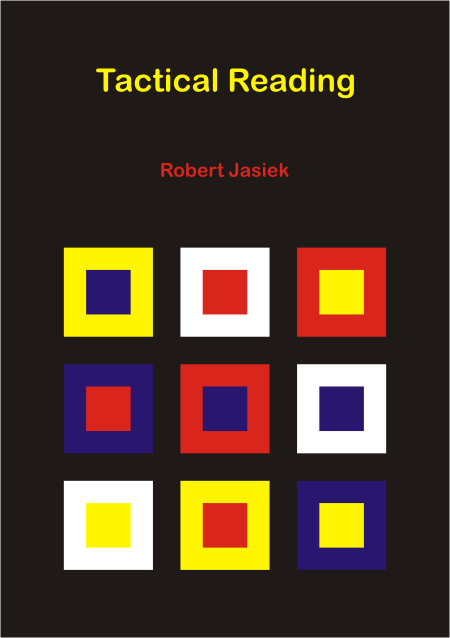 The author and publisher of Tactical Reading is Robert Jasiek. The book is of A5 size, has 267 pages, has 5.5 diagrams per page on average, is written for players from circa 13 kyu to 3 dan and has the suggested price EUR 26.50 (book) or EUR 13.25 (PDF). Please visit this page for the review. I wasn't sure what to expect of Tactical Reading. I didn't check the preview, but since I have reviewed a couple of books by Robert (Positional Judgement: Territory and Fighting Fundamentals, I found both excellent) and purchased another one (Easy Learning Joseki, I should write a review someday, I've found it quite good so far as reference), I thought I was a good fit for reviewing another now that Robert wanted more reviews. My interest in improving reading made it an easy decision, and I chose Tactical Reading. The TL;DR (too long, didn't read) version of this review would be: condensed common sense. Recommended, but not a must-have book. Since both the PDF version and the book look exactly the same, judging the printed look is shared between the PDF and the printed copy. The typesetting is good, diagrams are abundant and good-looking. As usual with Robert, the language is a little dry and sometimes "boring" but I feel like it is getting better really quickly. Also, once you have read one of his books you just get used to it, so it's not that big of a deal anyway. The book is divided in two parts. The first contains the theoretical knowledge about tactical reading that Robert exposes, while the second is comprised of problems having detailed explanations about how they are supposed to be analysed, after following the rules and recipes from the first part. The theory is interesting, but it doesn't feel 100% new (at least to me, because I've read a lot about the subject applied to Chess, due to the lack of a go focused book... which actually Tactical Reading is). Of course, it is the first time it is written about in detailed form and specifically for go players, but as far as analysing moves in one's head, they are kind of "known in the wild". The main ideas of tree exploration were already exposed by Kotov in "How to think like a grandmaster" (talk about dry exposure! Robert's is much easier to digest than Kotov's, and is much clearer), and most of the simplification, clarification and more rules that the book explains are what I am already doing while reading. I'd expect anyone else stronger than me (~5k EGF) to already be doing or at least trying, to read in the way recommended by the book. For me, it feels like this is just common sense written down, but actually I can't be sure about what other people think about while reading. So, if unsure, get the book and find for yourself. I feel like its usefulness range (as far as theory goes) is from ~20k to probably 1k-1d. I guess players stronger than 1d are already following all these rules, even if unconsciously, and most 3k and up probably do so or are working on it. A sweet spot is probably in the range 12k-8k EGF, where drilling common sense is probably best and has longer term consequences. The problems, though, are very interesting. They are Robert's composing, and they don't involve specially deep reading (5-6 moves at most, and they are not specially deep-branching situations) and are analysed incredibly thoroughly, involving at least 10-15 diagrams on average. Only for this problem section the book is worth its price: you can never have too many problem sets at home. As of this writing I have not finished all the problems (life happens, and has happened strongly: relocated to ~1h from Barcelona, finished PhD, started working as contractor in London "commuting" in and out every 1-3 weeks...) but as usual I plan to do so as soon as I get back to my normal go & tsumego groove. And probably re-read Fighting Fundamentals again, I've felt extremely rusty when I play or check games lately. My initial impression of the book content - as well as Robert's prompt delivery - was positive. Shortly after I had started reading the electronic copy of the book, I received a hard copy in the mail. One of the first things I checked was the binding: it was high quality. Contrary to some other go books that I have (e.g. Yilun Yang's Ingenious Life & Death books), the binding is sturdy. The typesetting was of high quality. All-in-all, the book is put together in a very professional manner. The only thing I found odd about the construction of the book was that the title along the spine of the book appears to be upside-down compared to most of the other English books that I have. This is minor, but it was a bit odd to me. I'm not aware of any other book that covers the theory behind reading. "Tactical Reading" is split into two main sections: (1) Reading Theory; (2) Problems. There's also a brief introduction section at the start of the book. I will start off by saying that the problems are very good. I'm around KGS 1d at the moment, and I enjoyed them. At my level, the problems require a bit of thought, and even if you are not KGS 1d, you can follow the principles in the book to obtain a solution. Robert mentions in the introduction that the non-full board positions are his own creations (with some of the full board positions being taken from games on KGS). What is unique about "Tactical Reading" compared to other problem books is the section on "Reading Theory". At first, I was somewhat skeptical of the book, because I believe that problems are necessary to improve one's reading ability. I was happy to read in the introduction of the book, however, that Robert also expresses the importance of practicing reading the reading principles outlined in the book. I've never read any of Robert's books before, but if I were to sum up the content of the "Reading Theory" section of the book in one word, I'd say that it is "accurate". Robert outlines a systematic method for reading, which is applicable to any situation that you might find on the go board. He explains the idea of obtaining an aim for a given player, and also explains the concept of direction in reading - when to go forward, when to go backward, what information to propogate, and when to consider a new candidate move. Robert also outlines a simplified form of reading, which can sometimes be helpful, known as "Test Reading", where only a threshold number of moves are considered. And of course, as I mentioned above, I enjoyed the problems. I think that the problems were an excellent addition to the book, providing a good way to practice the reading theory outlined in the earlier sections of the book. While I do feel that Robert's method for reading is accurate, in a sense, it is somewhat obvious. For anyone that has experience in doing go problems, the systematic process of selecting candidate moves, exploring them, propogating information as to whether a given branch succeeds, etc., are all familiar. Furthermore, having studied breadth-first search and depth-first search myself as a computer science student, Robert's formal definitions of this process didn't seem to provide new ideas that I wasn't already familiar with. In particular, the process of systematically iterating through candidate moves and exploring them is already something I knew how to do. But key to this process is selecting what Robert refers to as "interesting next moves". But very little is said to describe how to identify "interesting next moves". Secondly, in discussing terminal positions, the book explains that "non-obvious" statuses should be explored. "Obviously inferior" moves are also ignored for the sake of simplification. In my opinion, the process of systematic iteration and propogating of information is the "obvious" part of reading. Ideally, I would have preferred to have additional discussion on how to actually identify which moves are "interesting"... And perhaps how to clearly see whether or not a status is "non-obvious". What is "interesting" or "obvious" can be better understood by practicing reading, but nonetheless, these concepts are key to Robert's algorithm for reading. Overall, I am impressed with Robert's thorough explanation of reading. I think what he's written is very accurate. The problems are very good. I don't think that the section on theory provides much new information that experienced go players don't already know. So in a sense, I think that the problems he provides are more useful toward improvement than the section on reading theory. That being said, reading Robert's section on theory was actually helpful to me, even though I thought that it was obvious. Namely, it's an excellent reminder for me when I am "stuck" on a go problem: even if the problem seems impossible to solve, the solution is there. I can systematically find it using the method Robert defines. Sometimes a problem seems impossible, but it is always solvable when you go back to the basics. Robert's book outlines these basics (even though the process in itself is basic). Strategy, tactics and judgement are the major aspects of Go skill. Tactics rely on reading and prior knowledge. Reading is the process of imagining tactical sequences of well chosen moves. Prior knowledge abbreviates current reading by relying on the results of earlier reading. Since unguided tactical reading can be arbitrarily complex, we need means of simplification: reading principles and methods, techniques and prior shape knowledge. This book uses the holistic approach of providing a generally applicable explanation of reading: the emphasised reading principles and methods apply to all, or a great fraction of all, problems occurring in one's actual games. The book tells us in general how to read and how to solve problems correctly and efficiently. The answers to the problems provide a detailed explanation of the thinking when reading sequences and making decisions. Besides an introductory overview on the theory, a short conclusion and an index of keywords and techniques, the book consists of two parts: theory (95 pages) and problems (153 pages). The chapter of theory of tactical reading explains the basics, simplifications and two methods. The basics include the following topics: aims, imagining sequences, choice, iteration, correct reading and essential status knowledge. Teaching relies on principles, general explanations and examples. Most of the principles are short, therefore easy to learn and remember, and always applicable (e. g., ignore obvious failures and obviously inferior moves). A few other principles are frequently worth considering (e.g., ordering moves by perceived likelihood of success) or applicable only under special circumstances (e.g., in the case of a symmetric shape). Every principle is accompanied by circa three, often simple, examples. The topic 'aims' discusses the opponent's complementary aim, formulating good aims, secondary aims, verification of a one-sided status and intentional sacrifices. The subchapter of imagining sequences describes shortly how to imagine them and how to construct meaningful sequences. The theory of choice, correct reading and essential status knowledge is so basic and important that one wonders why almost all kyu players do not apply it; they get their ultimately clear reminder to adopt and always apply the related principles. Due to the complexity of unguided reading, reading theory must provide such kinds of great simplifications that maintain the correctness of solutions. Besides what has been mentioned before, the book provides, in particular, the following additional kinds of such simplifications: successful choice of the next move, good purpose, interesting moves, sequences of obvious moves, reversion, prior knowledge and important moves. Every related principle is very powerful and efficiently discards many superfluous variations. Besides the swift, but rarely applicable, method of 'test reading', the major method is called 'regular reading'. This fundamental method applies to every problem of tactical reading and is what every player is, or should be, using. Furthermore, the method incorporates the major principles of simplification. Despite the central importance of regular reading, its accurate description remained a mystery and the author needed to invest meticulous effort to write it down correctly. The reader gets several chances to understand regular reading well. Before the method itself is stated, the basic theory chapters introduce every single aspect, and iteration of sequences and follow-up variations is explained in theory and with detailed examples. Then the meaning of each of the method's aspects is discussed carefully, examples explain them and extraordinarily detailed examples demonstrate the application of regular reading and the thinking of related decision-making. The book contains 100 problems, of which almost all are newly invented, on the topics of important moves (10 problems), connection and cut (27), block (10), capture and prevented capture (42), miscellaneous (11). These are the most basic, by far most frequent and therefore most important topics of tactical reading. The capture topic includes simple captures of cutting strings as well as life and death problems. The problem diagrams have a big size to ease the reading exercise. A chapter starts with its problem diagrams and concludes with the separate answers. In each chapter, the problems are sorted by increasing difficulty so that the reader learns his current limit and is trained for the more difficult problems. 61 problems have at most 5 (typically 3) answer diagrams and explanations on 29 pages while the 39 most difficult problems have at least 6 (and up to 64) answer diagrams on 104 pages. This balance gives the reader both enough reasonably easy problems to become familiar with reading and enough intermediate (and a few advanced) problems to learn well also more demanding reading. Players from 13 kyu to 3 dan find suitable problems, which resemble problems occurring in real games. The problem tasks include next move problems, establishing connection, cut, life or death, and verifying the status of connection or life. Occasionally, playing elsewhere, sente or endgame play a role. The problems show the variety of reading skill necessary in one's games: there can be one or several correct first moves - or none. Reading must verify the latter by refuting each interesting first move. This can be more difficult than finding some successful first move. Since the reader does not know in advance whether a successful move exists, his reading must be particularly careful. The problems apply the theory of regular reading and its simplifications so that the reader perceives how well he has already learnt and understood the theory. The answers are as detailed as necessary; they include all relevant variations (whether successful or failing) and all the necessary decision-making for every branching position! The explanations distinguish the mandatory from the superfluous sequences. Most diagrams show non-branching sequences with a few moves. When a variation proceeds after a branching position, the move numbering is consistent by continuing with the next move number. All these aspects ease following the diagram sequences, understanding where reading branches and subsequent variations begin and recognising the reader's related reading mistakes. He understands when further exploration of non-essential variations may be interrupted by proceeding with the essential sequences. Every answer begins with a reference list of the used key methods, simplifications and techniques and, if the problem has not already specified it, the aim to be verified by reading. Every answer to a more complicated problem also has an initial overview, a conclusion and a summary of techniques and sometimes simplifications. The latter discusses the extent to which techniques have been relevant for solving the problem; more often than not techniques play an only marginal role while the major effort of solving the problem consists of regular reading and its inherent simplifications and decision-making. The answers to the few most difficult problems provide summarising, very condensed tables of move decisions as another aid, whose reading is optional but can help some readers. Despite the central importance of tactics, generally applicable theory of reading and its means of simplification, there has been no English book (and the author has never seen any book) devoting itself entirely to the topic of tactical reading and teaching general theory of simplifying reading. Maybe this is so because writing a book on the theory of reading is a very demanding task. There have been only the too short introductory chapters in Tesuji (Davies) and First Fundamentals (Jasiek). In order to learn how to read and solve problems well and correctly, Tactical Reading has been overdue. They presume, but do not explain, generally applicable theory, such as the method of regular reading and its inherent means of simplification. Techniques and shape knowledge are emphasised although these means have a very limited scope of application. There are many techniques but every technique only is relevant in a small fraction of all problem positions. Even an impressive knowledge of particular shapes only represents a tiny fraction of all possible shapes, and two very similar shapes can have different tactical behaviours. One is lost amidst too many techniques and particular shapes, often without knowing when to apply which, or how to read when (as is frequent) none applies or suffices. Almost all their problems have a 'solution' so that the more realistic variety of some successful first move versus none is not trained well. For intermediate and advanced problems, they only show a small random selection of 'exciting' variations. Most explanation of the related thinking and decision-making is missing. Tactical Reading explains the general theory, emphasises the always applicable regular reading and general means of simplification more than the too specialised techniques and shapes, offers problems with or without successful solution, shows all relevant variations and explains all the necessary decision-making. Despite a good percentage of easy-to-understand contents, beginners weaker than 13 kyu can be overwhelmed by the sheer amount of contents and frequency of intermediate level moves. Players stronger than 3 dan should know all the theory; nevertheless, they might profit from the book if they missed just one of the important means or principles of simplification. The book describes tactical reading but forgoes dynamic reading with flexibly changing aims and strategic reading above the level of tactics. These can be topics for later books. Despite an explanation of the most important techniques in a short theory chapter and some 40 techniques (which occur in the answers to the problems) listed in the index, the book does not make any attempt of providing a comprehensive overview on the hundreds or possibly thousands of existing techniques. In the conflict between maintained quality contents, minimised large white spaces, important contents on the same page and unimportant contents on the same page, the layout sacrifices the latter. This makes reading of the PDF edition slightly inconvenient. For perfect layout, the book would have to be split into two volumes, doubling the price. Instead of many words, permit the author's simple personal statement: I would have loved a much earlier access to such a book teaching how to solve tactical problems efficiently! The Table of Contents is at the author's site.